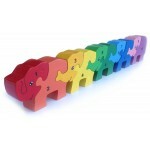 This colourful Snail puzzle features alphabet characters on one side and numbers on the other. Learn your ABCs and to count to 26. Made from sustainable Albizia wood harvested after its useful life as windbreaks on tea plantations in central Sri Lanka, and finished with non-toxic, lead and AZO free paint, non- toxic dyes. This line of Elephants fit together like a puzzle with colours ordered .. This colourful Snail puzzle features alphabet upper case characters on ..